Julia Cisneros presented aspects of her PhD research at the 2019 International Conference on Marine and River Dune Dynamics, and came away with the award for best graduate talk. The Department of Geology again participated in Engineering Open House (EoH) this year on March 8-9th, with record numbers visiting NHB! This time lapse video by Max Christie shows the interactive augmented reality sandbox and many enthusiastic hands over one hour during EoH! Jess Conroy has won a highly competitive NSF CAREER award that will allow her to pursue a 5-year research program to advance our understanding of the water cycle in the tropical Pacific. Prestigious NSF award supports research on the formation of Great Unconformity. Professor Trish Gregg has been awarded a 3-year, $540k grant, from NASA’s Earth Surface and Interior program to investigate the unrest of several volcanoes along the Aleutian Arc of Alaska. Lunar Regolith Derived From The Earth's Archean Crust? Dr. Fang Huang, who earned his Ph.D. in 2007, working on igneous petrology and isotope geochemistry with Prof. Lundstrom, has been highlighted in the Geochemical Society's monthly newsletter. The Department, along with the Illinois State Geological Survey, is fortunate to have been granted access to software donated by Petroleum Experts to use in research and education of students. The software, known as Move, is a premier structural geology modeling and analysis toolkit.. Professor Jim Best has published a major review paper in the January 2019 issue of Nature Geoscience that examines the major anthropogenic stresses faced by the world’s great rivers. Listen to Professor Bruce Fouke discuss his groups work on the geology of kidney stones on NPR’s ‘The People’s Pharmacy’. Prof. Willy Guenthner’s (U-Th)/He lab is featured in a new AGU EOS article. Prof. Don U. Deere, who taught Engineering Geology at Illinois from 1955 to 1972, passed away on January 14, 2018. Don was a world-renowned engineering geologist and expert on tunneling, dam building and design, and the construction of large underground spaces. Professor Trish Gregg has been recognized as a Liberal Arts and Sciences LEAP Scholar for her contributions and potential in both teaching and research. On October 4th, 2018, the department’s Alumni Achievement Award was presented to Dr. Norbert E. Cygan (B.S. ’54; Ph.D. ’62). Norb returned to campus and presenting a talk "The multi-million-pound uranium deposit at Panna Maria, TX and my 65-year journey in Geology.” Norb was recognized by the department for his contributions, over a 65-year career, to industry, academia, and a variety of education and outreach organizations. Professor Jim Best and colleagues at the University of Notre Dame have used a unique refractive-index matching flume to gain new insights into how barchan dunes interact. Geology Ph.D. student Robby Goldman was chosen by the American Geophysical Union (AGU) to take part in the AGU Voices for Science program. Prof. Bruce Fouke and collaborators at the Mayo Clinic have teamed up to use geological reasoning and high-end microscopy to learn fundamentally new and medically important things about human kidney stones! Students, staff and faculty of all three departments of the School of Earth Society and Environment (Geology, Atmospheric Science, and Geography and GIS) enjoyed warm, breezy weather for the annual "First Day of Class” Barbecue, August 27th, 2018. Dispatch from Wasatch-Uinta Field Camp 2018! Prof. Michael Stewart and the Illinois students attending the Wasatch-Uinta Summer Field Course based out of Park City, Utah have been working hard and observing some of the best Geology the west has to offer. Assistant Professor Trish Gregg has been awarded a National Science Foundation CAREER award for her proposal Investigating the unrest and eruption potential of caldera forming volcanoes in the Aleutians. Yan Zhan, a 4th year Geology Ph.D. candidate in Prof. Trish Gregg's Volcano Geodynamics group, has been awarded a prestigious NASA Earth and Space Sciences Graduate Fellowship. Professor Tom Johnson has been elected a Fellow of the Geological Society of America. PhD graduate student Julia Cisneros has been awarded a Graduate Research Opportunities Worldwide (GROW) grant from the Division of Graduate Education at the National Science Foundation. Prof. George Klein, a sedimentary geologist who served on the UIUC Geology faculty from 1970 to 1993, passed away on April 30th. PhD candidate Haley Cabaniss, Prof. Trish Gregg and collaborator Prof. Eric Grosfils publish a paper in Geophysical Research Letters that lifts the lid on the precursors to supervolcano eruptions. Professor Trish Gregg was one of eight National Center for Supercomputing Applications (NCSA) Faculty Fellowship awardees for 2017-18. The Fellowship program provided $25,000 to support the development of a High Performance Computing method for combining large volcano monitoring data sets with sophisticated geodynamic models. Gregg presented results from her NCSA Faculty Fellowship Project: "A Data Assimilation Framework for Forecasting Volcanic Unrest", Monday April 23rd, 2018. Professor Best Awarded The Lamarck Medal from EGU! Prof. Jim Best was awarded the 2018 Jean Baptiste Lamarck Medal by the European Geosciences Union at the EGU annual meeting in Vienna, April 9th, 2018. The Lamarck Medal was established by the EGU Stratigraphy, Sedimentology and Paleontology Division, in recognition of the scientific achievement of Jean Baptiste Lamarck. It is awarded to scientists for their exceptional contributions to stratigraphy, sedimentology or palaeontology. The Medal is awarded to Prof. Best this year for "major contributions to our understanding of physical sedimentary processes and their products in the geological record." Second year geophysics Ph.D. student, John “Jack" Albright, has been awarded a prestigious NSF Graduate Research Fellowship. This is the fourth NSF Fellowship awarded to UIUC Geology grad students in the past three years, an unprecedented level of success!! The Department's Spring Oil and Gas Industry Short Course,sponsored by Royal Dutch Shell, "Controls on and Prediction of Sandstone Porosity and Permeability," was taught by Drs. Linda Bonnell and Rob Lander on March 10th and 11th. The department's Eryops Skeleton replica is being repaired in preparation for its return to NHB, with the help of Christa Deacy-Quinn from the Spurlock museum. Click here for blog posts as the project proceeds. Graduate students Jiashun Hu and Quan Zhou, with Faculty Lijun Liu, Craig Lundstrom and Stephen Marshak, reveal a new story of the geological history of cratons in South America and Africa. Leah Matchett, a Geology alumna from the class of 2016, is one of 49 students selected in the first year of the Knight-Hennessy Scholar program for postgraduate study at Stanford University. See the Illinois News Bureau story about Leah here. The Great Unconformity: Erosion linked to supercontinent cycles and snowball Earth? Graduate student Mike DeLucia, and advisors Willy Guenthner and Steve Marshak, have constrained the timing and magnitude of erosion that produced the Great Unconformity surface (the global erosion surface separating Precambrian and Paleozoic rocks) in the St. Francois Mountains of Missouri (an area well know to many Illinois Geology students)! The department's 3-D model of parts of the Colorado Plateau, including the Grand Canyon and southern Utah, found its new home in the Natural History Building, after about 4 years in storage. The Department of Geology continues to bring its historical treasures back into the Natural History Building. Several detailed replicas of fossils that were part of the early natural history displays in NHB have been brought out of storage and are being mounted in the hallways for all to see. The Univ. of Illinois is hosting the 55th Annual Meeting of the Clay Minerals Society (CMS) on June 10 - 14, 2018. Prof. Stephen Altaner, who is on the Organizing Committee, will lead a field trip to the Starved Rock State Park area, a field trip to the type locality of illite, and a thematic session on Teaching and History of Clay Sciences. The U of I also hosted the CMS meeting in 2013 when it was one of the most attended meetings in CMS history. In a paper “Western US volcanism due to intruding oceanic mantle driven by ancient Farallon slabs” published in Nature Geoscience, Lijun Liu and graduate students Quan Zhou and Jiashun Hu have employed seismic tomography to reveal new insights into the origin of Yellowstone volcanism and challenge existing views on deep mantle plumes. Julia Cisneros was invited as the sole student representative of the University of Illinois at Urbana Champaign to speak about her research and fieldwork in the Amazon and Yellow Rivers and showcase the importance of applied fieldwork and student research opportunities to the Chancellor, President, and Board of Trustees. Assistant Professor Wendy Yang’s recent paper “Evaluating the Classical Versus and Emerging Conceptual Model of Peatland Methane Dynamics” published in Global Biogeochemical Cycles has been recognized as a significant contribution and highlighted in the EOS Research Spotlight. Graduate student Julia Cisneros won a National Science Foundation Graduate Fellowship this fall for a project titled “Dune morphology and dynamics in fluvial channels." Professor Emeritus Susan Kieffer is a leader in the emerging field of Geoethics. This year she received the Marcus Milling Legendary Geoscientist Medal of the American Geoscience Institute and contributed to a book chapter on Geoethics. Dr. Kieffer is also presenting an invited paper at the fall meeting of the American Geophysical Union: The International Association for Promoting Geoethics (IAPG) by Susan Kieffer, Silvia Peppoloni and Giuseppe di Capua. Union Session U12A: How do we ensure research integrity? Graduate student Robert Goldman won an NSF Graduate Research Fellowship in fall 2017 based on his proposal "Developing a Comprehensive 3D Finite Element Model of Magma Plumbing Systems to Improve Forecasts of Eruption Timing, Location, and Destructive Potential." Graduate student Yan Zhan, advised by Trish Gregg, had a paper accepted in Frontiers in Earth Science. This work demonstrates how modeling the eruption potential of a restless volcano can be improved by incorporating volcano monitoring data by “hindcasting” a 2009 explosive eruption of Kerinci volcano, Indonesia. Crunchflow, a computer modeling package developed partially by Prof Jenny Druhan, has received a prestigious R&D 100 award from R&D Magazine. On November 3rd, 2017, Prof. R. James Kirkpatrick (PhD ’72), Dean of the College of Natural Sciences at Michigan State University, was presented with the department’s Alumni Achievement Award. 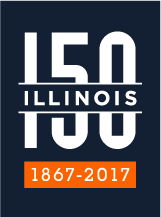 Jim is well known to many current and former members of the department, having served UIUC for nearly 30 years as a faculty member, department head, and executive associate dean (10 years). Assistant Professor Jessica Conroy has been included in a list of 7 women climate scientists in an article published in The Guardian. The piece highlights the successes and contributions of several prominent women climate scientists. November 4th, 2017: Please join us for a grand event to mark the re-dedication of the Natural History Building! Geology alumni from all over will be converging on NHB for a re-dedication ceremony, tours, and plenty of socializing to celebrate the completion of this once-in-a-lifetime renewal of the traditional home of Geology, on the quad. Prof. Jim Best will be awarded the 2018 Lamarck Medal from the Division on Stratigraphy, Sedimentology and Paleontology of the European Geosciences Union! In Spring, 2018, the Geology 415/515 Field Course will return to Scotland! Professors Anders, Gregg, Stewart and Burmeister will lead a group of 22 students to visit classic localities to investigate glacial geomorphology, super volcanoes, the rifting of Pangaea and thrust tectonics. Department of Geology Offices Return to NHB! Department of Geology faculty and grad student offices have moved back into the Natural History Building. We are now located on the east side of the third floor. The building looks and feels wonderful!